This article was written By REVIEWER on 08 Jun 2011, and is filed under Reviews. 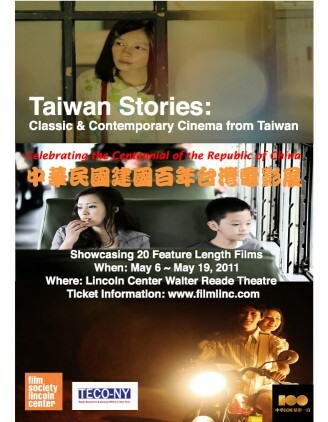 In celebration of the Centennial of the Republic of China, the Walter Reade Theater hosts a rare panorama of the ever-surprising Taiwanese Cinema – from the intimate looks at daily life in the early 1960s, to the breathtaking new wave of filmmakers that arose in the 1980s (such as Hou Hsiao-Hsien and Edward Yang), and on to the fresh turning point marked by recent Taiwanese hits. It all began with a chicken leg. The start of a close brotherhood, a makeshift family for a young man who never had one and the subsequent bloody downfall all stem from an arrogant punk, Dog Boy (Han-Tien Chen), taking the wrong kid”s lunch. Getting his start in the entertainment business by starring in a series of critically acclaimed films directed by Hou Hsiao-hsien, Doze Niu eventually made a complete break from acting, started his own production company, Red Bean Production Co, and fully committed himself to directing. His debut, What on Earth Have I Done Wrong?! (Qing Fei De Yi Zhi Sheng Cun Zhi Dao, 2007), garnered the actor-director a lot of critical acclaim, winning a Golden Horse award for best film as well as a FIPRESCI Prize. For his sophomore film, Niu mines his own life and the tropes of a universally loved genre, the gangster picture, to create an enjoyable 141 minute film. Titled after one of the oldest districts in Taipei, Monga (2010) is set in the mid-1980s and has as its central core the theme of brotherhood and loyalty. Mosquito (Mark Chao) finding no other way to survive high school ends up joining the “Gang of Princes”, a motley crew of street urchins who are more of a tight-knit boys club than a gang. They engage in the occasional street rumble but because the gang”s mullet-haired leader, Dragon Lee (Rhydian Vaughan), is the son of Geta (Ma Zu-Long), one of Taipei”s most respected underworld kingpins, trouble tends to vanish into the ether. Mostly, these bored young men spend their days drinking, riding their motorcycles around town, and spending the few bits of cash they have on girls or in the local brothel. Of course, just as in every coming-of-age gangster picture these five friends will eventually turn against one another. Be it for reasons of money, power, or the age-old standby, familial vendetta, ultimately good friends will reveal themselves to be like coiled vipers ready to strike at the first signs of weakness and bitter enemies will turn out to be surprising allies. Unlike American gangster pictures which usually hinge on a rise-and-fall narrative, e.g. Martin Scorsese”s Goodfellas (1990), or Japanese yakuza eiga which have at the center of the drama the conflict between giri and ninjo, e.g. Kinji Fukasaku”s Jingi Naki Tatakai (Battles Without Honor and Humanity, 1973-1974) series, Doze”s film is predominantly concerned with the illusory nature of loyalty and brotherhood. The gang”s formation was born primarily out of a need to survive and the bonds between each member are strengthened or weakened depending on who stands at the top of the totem pole. Monk (Ethan Ruan), the clear alpha male in the group, gladly takes a beating online casino to protect his brothers from further reprisals, but his blind loyalty quickly evaporates upon discovering that his own father, a rising figure in online casino the criminal underworld during his time, was forced to capitulate to gang politics, relinquish control over to Monk”s current boss, Geta, and had one of his arms chopped off by him as punishment. When the choice is presented to these eager young men, brotherhood or power, the latter is of far greater importance to one”s survival than the former. However, Doze doesn”t just mine the gangster film to entertain his audience; there is squeezed into Monga an extended training sequence which is clearly lifted from any number of 70s-era wuxia. The boys train in traditional martial arts, including a mastery in several forms of of weaponry, and to round it all up, Geta shows up towards the end of the training montage to espouse his philosophy on the purity of fighting with one”s fists and the dishonor in even thinking about picking up a gun. Although a few minutes too long, Doze Niu”s Monga is an entertaining masculine drama. It has all the requisite ingredients for a successful gangster picture and even throws in a romantic subplot and bits of family drama into the mix. It treads familiar narrative grounds, but the film isn”t merely a parade of pretty faces parroting lines from a script. Ma Zu-Long and Doze Niu himself, playing the mysterious Grey Wolf, should be specifically commended since both men could convey through just a stare a lifetime”s worth of regret and sorrow. Watching the film I was reminded of Edward G. Robinson”s gangster roles whenever Geta ambled onto the screen and Grey Wolf was, in my opinion, channeling Paul Muni whenever he languorously took a drag of his cigarette or the handful of scenes in which he talked. The classic age of the gangster film may be over, but Monga proves that its influence has crossed the boundaries of time and culture.